Economical vapor phase activated carbon filtration drum filters and liquid phase activated carbon filter units are a great way to minimize capital costs and receive quick delivery, and the filter drum installation is an easy set up process. TIGG has a variety of activated carbon media for both liquid and vapor phase applications and our technical experts can work with you to select the best GAC filtration drum and activated carbon media to meet your needs. TIGG’s vapor phase GAC drum filters are ideal for removing VOCs in industrial manufacturing applications, to control vapor emissions and as odor control systems. The GAC adsorption drums can be used for tank vents, landfills, sumps and other vapor phase applications. 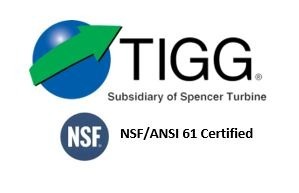 TIGG also offers the NITOX Blower Pack available for use in vapor phase applications with low flow requirements. TIGG’s liquid phase GAC drum adsorbers utilize a wide variety of media including coal and wood based GAC and coconut activated carbon. TIGG’s liquid phase drums are ideal to treat streams from groundwater remediation and storm water. The units also help purify industrial wastewater and are used in institutional and facility water conditioning and purification applications. For more information about TIGG’s Granular Activated Carbon Drum Filters, call 1-724-703-3020 or click here to contact us.